Sealed bids are invited from accredited Agencies providing services of qualified, trained and experienced IT Professionals as per our specific requirements under specific Terms and Conditions. 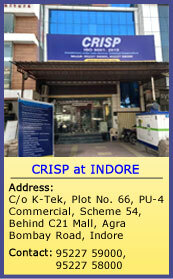 Detailed information with respect to this NIT may be downloaded from our website: www.crispindia.com. Your technical and financial bids duly contained in 2 separate and sealed covers shall be received by 2:00 p.m. on 28th May, 2018 at the counter of CRISP either by courier service or registered post. C.E.O., CRISP reserves the right to cancel any or all the bids without giving any reason therefor.